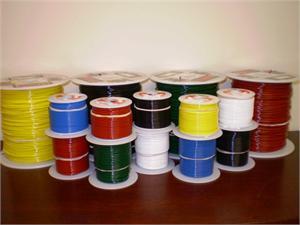 Description: Daburn Eco-DaFlex Wire is a UL certified environmentally friendly hook-up wire. Eco-DaFlex is RoHS and WEEE compliant because it does not contain any hazardous substances and, therefore, can be easily recycled. Eco-DaFlex is designed with modified polyphenylene ether (mPPE) thermoplastic, a zero-halogen insulation absent of any heavy metal pigments. When compared to PVC, mPPE is a 40% lighter, offers a 45% smaller diameter, and is a tougher more durable option. Conductors are tinned copper. This wire meets UL Style 11028. Eco-DaFlex Wire is manufactured by Daburn Electronics & Cable and equivalent to Alpha EcoWire®*.6710 through 6719. Daburn Eco-DaFlex Wire is RoHS, Reach and WEEE compliant and Halogen Free. *EcoWire® and EcoFlex® are registered trademarks of Alpha Wire. Daburn is not, in any way, related to, affiliated with or licensed by Alpha Wire or Belden Inc. Please call to order 10 AWG or to order non-stock colors. SIzes & Colors usually stocked and available online are indicated in the above chart. Please call or click above on "Contact Us" for availability of other sizes & colors.